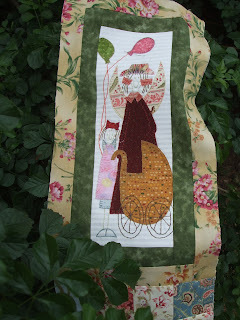 Hi Peg, Your angels are really cute, really wish I had done this quilt. Maybe next year I'll have more time for me some projects. You are a busy girl. Millie is wonderful! Love the hair bows!! We had strong winds here today too -- in fact, they blew over a tree somewhere in the city. A big tree! Millie looks fantastic; how many Angels are there altogether?? Your angels are turning out beautiful, I can't wait to see the finished quilt! My pattern arrived in the mail today. Very exciting! I see fusible-webbing is used for the applique. Are you noticing any fraying at the edges? That is the first thing I notice on any fused quilts I have seen. I'm considering doing needle-turn to be safe. The quilt is going to be lovely. I have the Angel book and need to make a start on it..perhaps in the new year..
Millie is wonderful. You are really good at these little angels. I love all of yours. I will start mine next year. I agree a nasty wind is the worst kind of weather. Millicent (Millie) is wonderful. I love your fabric choices. Your work is awesome! Thanks for sharing.